Embellished with the wings and halo of an angel, this wooden keepsake box is a fitting tribute to the love shared with a deceased loved one. With your personal touch, our personalized keepsake box is a great sympathy gift. 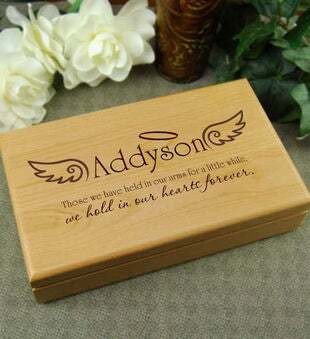 Personalized with a loved one's name, this wooden memory box will hold all those precious memories of a loved one and includes a thoughtful inscription that reads: "Those we have held in our arms for a little while, we hold in our hearts forever." this gift of comfort is constructed of alder wood and includes is felt-lined to cradle those treasured memories. This wooden keepsake box measures 10 1/2" x 6 1/4" x 2 1/2".